This page is my log book for comet observations and imaging. The Astronomical League has a Comet Observer Program that awards a pin and certificate for observation and/or imaging of 12 separate comets. 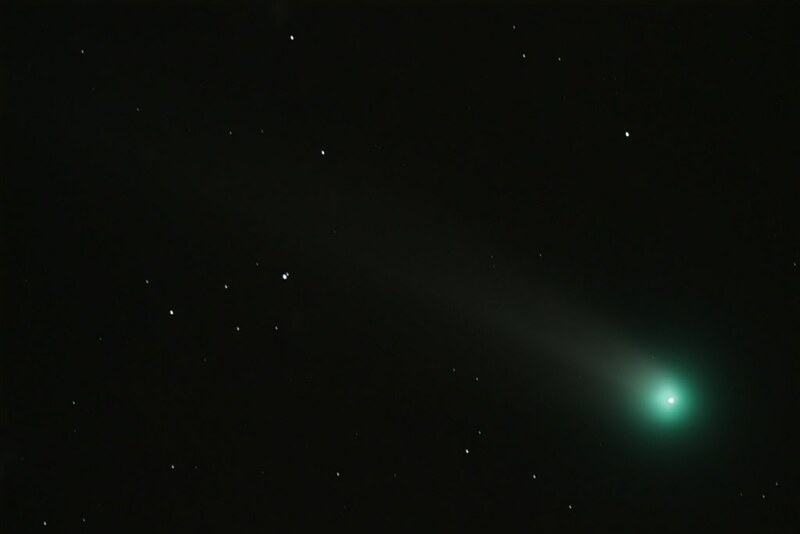 A very helpful resource in knowing what comets may be visible is the Weekly Information on Bright Comets page by Seiichi Yoshida. Also see the Skyhound Comet Chasing page. This list is ordered by most-recent observation first, grouped by comet. Clicking on the thumbnail image will open a new tab with the larger image on Flickr. Conditions: Above average seeing, average transparency which steadily declined through the evening. Heavy dew interrupted imaging when the lens fogged over around 10:PM. Comet Position: Comet C/2017 O1 ASASSN next to NGC 1624, a mag 11.8 open cluster within an emission nebula in Perseus. The bright star is HR 1493, a 5.8 Mag Double. Equipment: Canon T6s prime focus with SV80 APO w/0.8x FFR, Celestron CG-5 eq mount. Guided with Orion Magnificient Mini Autoguider. 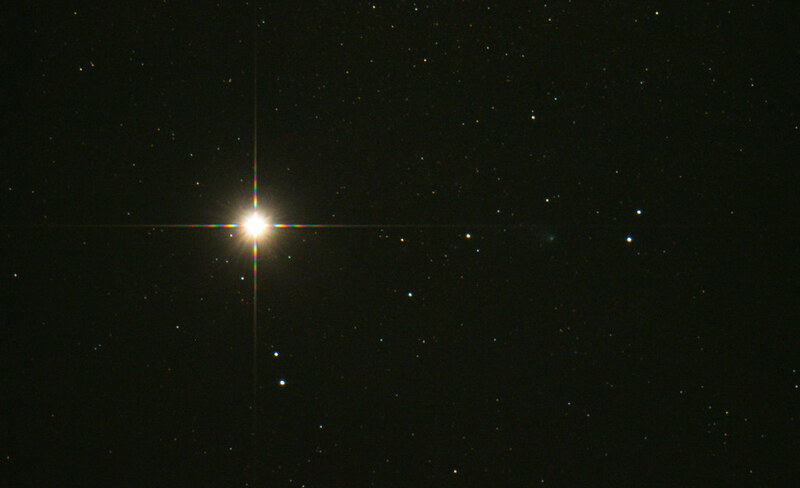 Conditions: Fair; imaged above the western horizon, into the light dome from Denver, CO.
Comet Position: In Pisces, approximately 1.8° above Omega Psc. Equipment: Canon T6s prime focus with SV80 APO w/0.8x FFR, Celestron CGEM eq mount. Guided with Orion Magnificient Mini Autoguider. Conditions: New moon, intermittent thin wispy clouds. 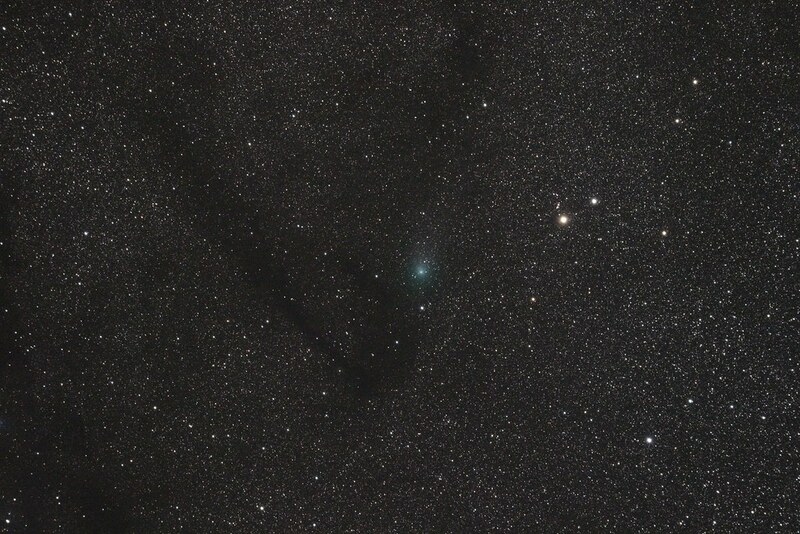 Comet Position: In Perseus, approximately 0.5° from M76 (visible in the image to the right of the comet tail). Image: Single 120 second exposure, ISO 3200. Tracking was on the stars. Note the disconnect in the tail in the top 1/3rd of the image. The bright star in the image is Phi Persei. Equipment: Canon T3i prime focus with SV80 APO w/0.8x FFR, Celestron CGEM eq mount. Guided with Orion Magnificient Mini Autoguider. Conditions: New moon, intermittent thin wispy clouds (visible in the right-side of the image). Comet Position: In Ares, approximately 8° from the Pleiades cluster. Image: 8 x 240 second exposures, ISO 1600. Tracking was on the stars. Image was stacked on both the comet and the stars, then combined. Equipment: Canon T3i with Canon 50mm f/1.8 Lens @ f/3.5 piggyback on SV80 APO, Celestron CGEM eq mount. Guided with Orion Magnificient Mini Autoguider. Image: 11 x 240 second exposures, ISO 1600. Tracking was on the comet. Equipment: Canon T3i prime focus with Stellarvue SV80ST-25 APO plus Astro-Tech field flattener. Celestron CG-5 eq mount, and Orion Magnificient Mini Autoguider. Image: 1 x 3min exposure. Equipment: Canon T3i prime focus with 6″ F/9 1370mm Astro-Tech ritchey-chrétien astrograph plus Astro-Tech field flattener. Celestron CG-5 eq mount, and Orion Magnificient Mini Autoguider. The bright object is Mars; this image was taken approximately 8 hours after the close approach of the two. 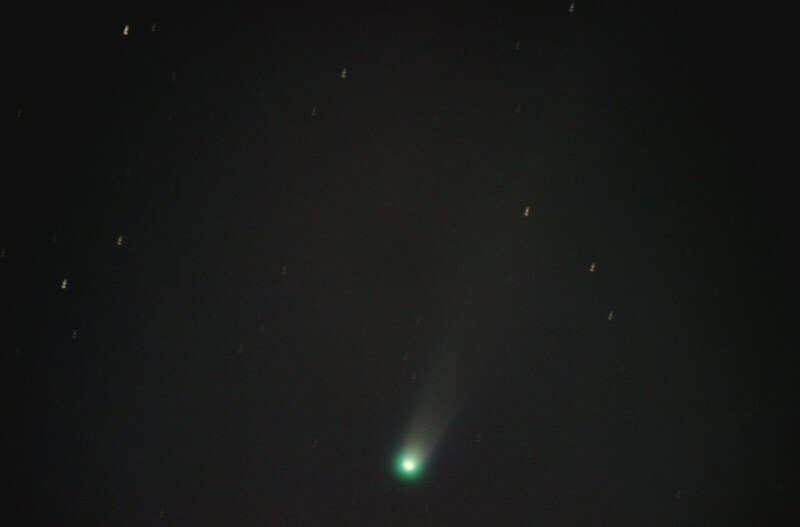 The comet can be seen at the point of the right diffraction spike with a faint tail. See the full size image on Flickr. Date Observed: September 16, 2014 between 8:30pm – 10:30pm MDT. Moon Phase: 3rd quarter, still below the horizon at time of observation. Image: 1 x 5min exposure taken tracking on the stars. Equipment: Canon T3i prime focus with Stellarvue SV80ST-25 APO plus Astro-Tech field flattener. Celestron CGEM eq mount, and Orion Magnificient Mini Autoguider. Date Observed: June 28, 2014 between 9:58pm – 10:16pm MDT. Moon Phase: New Moon, below horizon. Image: 3 x 90 sec exposure taken tracking on the stars. Click the image to view the animation. Comet Position: Below Cassiopeia, 00h 09m 07s RA, +57° 14′ 45″ Dec. Image: Animated gif of 5 x 120 second frames taken tracking on the stars. Animation shows the slight motion of the comet. I’ll note that my scope was out of collimation at the time. Mag: Approximately 8th – 9th magnitude. Moon Phase: Waxing Crescent, below the horizon. Comet Position: About 15° above hte horizon in Bootes, the comet forming the bottom point on an inverted equilateral triangle with Izar and Arcturus. 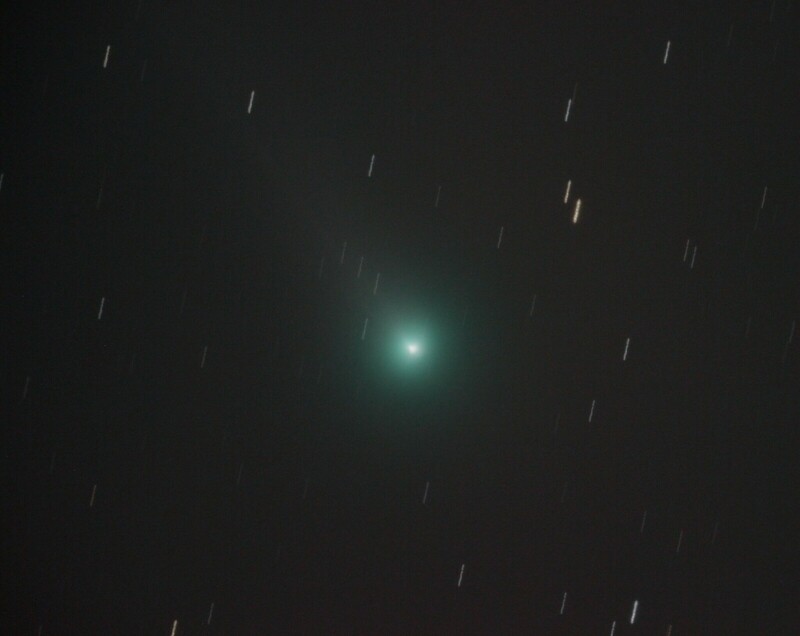 Image: 15 x 3min subs tracking on the comet. Mag: ~4-5, not naked eye identifyable. 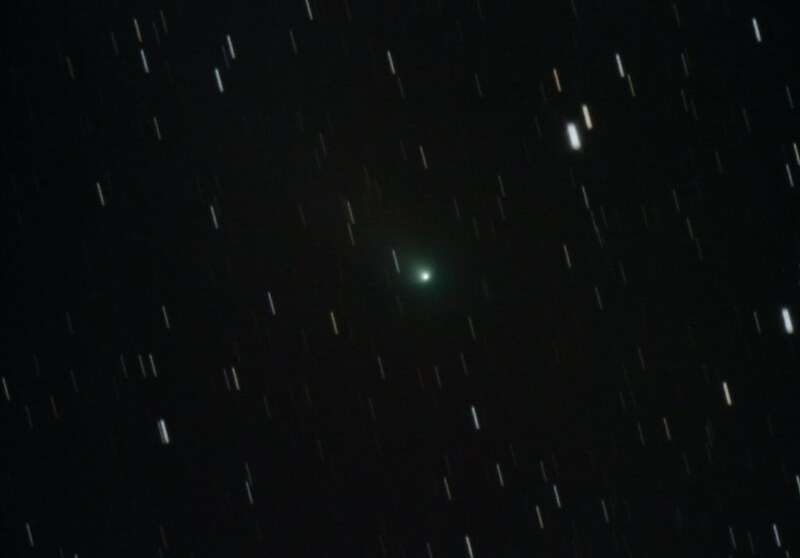 Image: 1 x 5min exposure taken tracking on the comet. First Observation: November 20, 2013 5:31-5:38 AM from Observatory Park in Denver, CO (heavy light pollution). Approximate magnitude 4-5; not naked eye visible at this location. The moon was 2 days past full 35° above the western horizon. Lovejoy was in Ursa Major, forming a right triangle with the comet in the 90° corner, and the stars Phecda in the big dipper and Cor Caroli in Canes Venatici forming the other corners. Alkaid at the end of the big dipper handle lies opposite the hypotenuse from the comet. 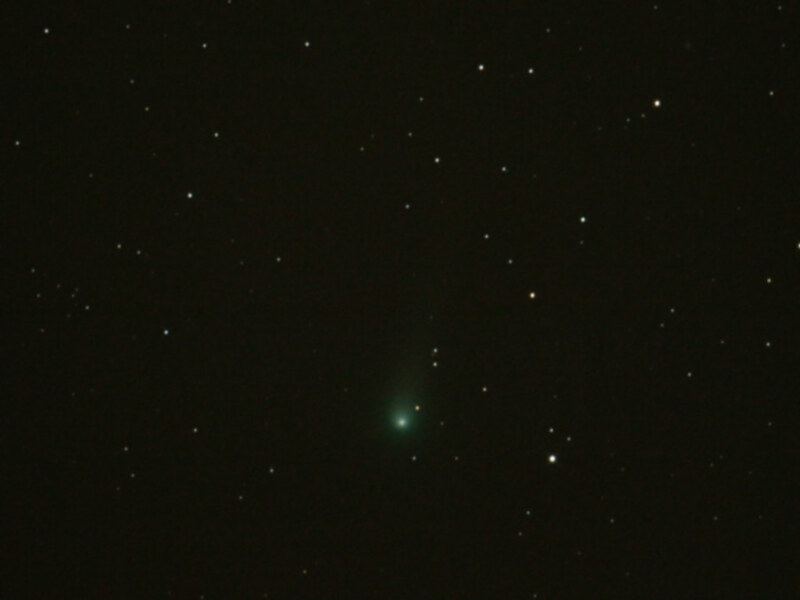 Image composed of 7 1-min subs tracking on the comet. Canon T3i prime focus with 6″ F/9 1370mm Astro-Tech ritchey-chrétien astrograph plus Astro-Tech field flattener. Celestron CG-5 eq mount, and Orion Magnificient Mini Autoguider. Mag: ~4-5 Approx. Not naked eye visible. Moon Phase: 2 days past full 35° above the western horizon. Comet Position: 12° above the E horizon, just below and left of Spica, with Mercury below and left of the comet at about equal distance. Image: 3 x 1min subs taken with 1min intervals between tracking on the comet. 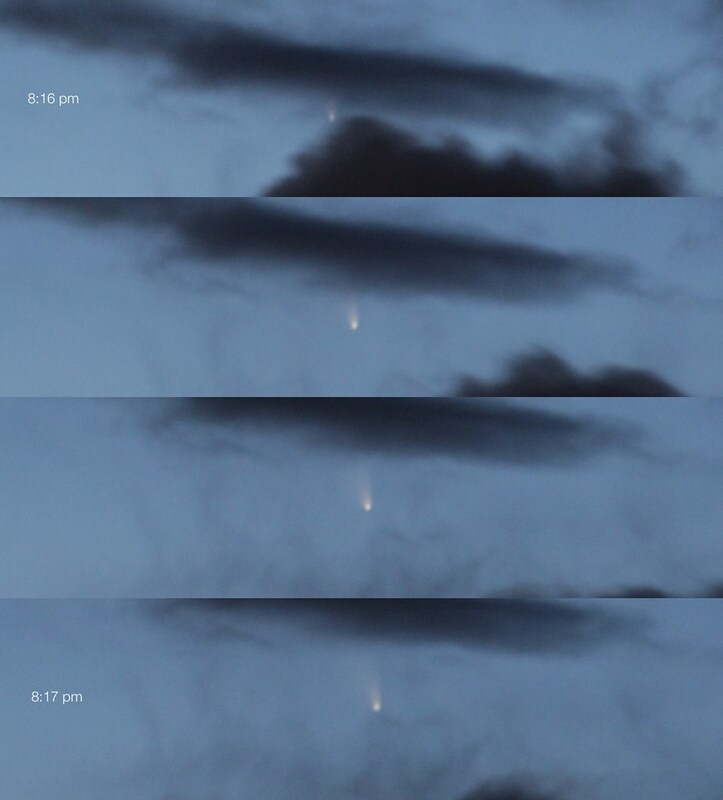 Multiple observations in the evenings between March 16, 2013 to March 29, 2013. Mag: Approximately 4th magnitude. Just naked eye visible. Equipment: Canon T3i with a EF-S 55-250mm f/4-5.6 IS Lens at 84mm, ISO 800, f/4.5 on a fixed tripod. 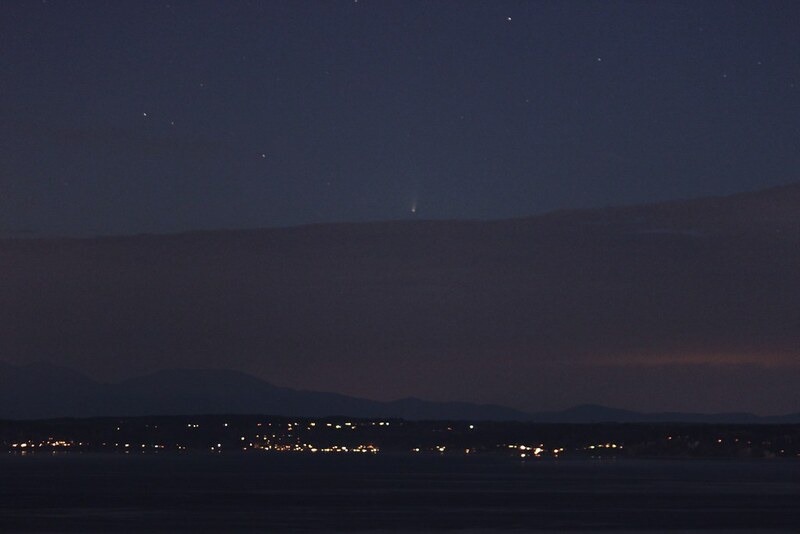 Comet Position: Just coming into visibility after sunset on the western horizon. Image: 4×6 sec exposures over a 2 minute period. Equipment: Canon T3i with a EF-S 55-250mm f/4-5.6 IS Lens at 250mm, ISO 1600, F9.5 on a fixed tripod.